I had a really nice past week, capped-off by a wonderful weekend. So many highlights...running, biking, more running, more biking. And a big red velvet cupcake with loads of fluffy, white icing. YUM! I had that really fun Tues. night ride, followed by 4 easy miles on-foot on Weds. I am so pleased that after the initial block or two of "oh, man...this still feels kinda weak/stiff/sore" things loosen-up and my ankle more-or-less feels pretty strong. Thursday's workout was 50 minutes of Cathe Friedrich's Muscle Max workout...all of the upper-body and abdominal work. I had not done this workout in ages. I've been mainly doing her Muscle Endurance workout, which is challenging, but involves lighter weights and higher reps. There was some grunting and whimpering going on in our living room on Thurday, to be honest. But it hurt so good. Now I'm starting to sport some teeny-tiny arm muscles--woot! Friday I logged what I think was my longest and fastest solo ride--just over 45 miles at an average of 16mph (I'd really love to see what my pace would be like if I never had to take corners or stop at stop signs...or slow going through town). Yesterday I did a short upper body and abs workout, then ran 5.3 miles (at roughly my pre-sprain pace...and that was during cooler, less humid weather). The run was great, except for the rubbing on the bottom of my left arch from my ankle brace. I think my days of running with the brace are numbered. I'm a bit hesitant to run without it, but I can't imagine going further than 5 miles with that thing on. Today was the end of the weekend, but a great start to this week. I rode 56.3 miles with the JDRF group. We enjoyed a varied course with some pretty, rural scenery. I felt especially strong for this ride, even though the first few pedal strokes felt sorta iffy. We got lost a few times and a few of us overshot a turn and ended up riding an extra 5 miles or so, but the cupcakes (and chips, fruit, veggies, cole slaw, and hot dogs) at the end were reward for the extra calories burned. My last couple of rides (totaling 100 miles, so a good distance to determine whether something works comfortably or doesn't work) have been with the stem on my bike "flipped," so that my handlebars can sit lower. But I still often feel like I want to be even less upright, so it may be time to remove some spacers (the little rings) from underneath my stem, slide the stem down, and put the spacers back on top. The photo at left is not of my bike, but it demonstrates the area of my bike that will be adjusted. The stem is the part in the photo with WCS. 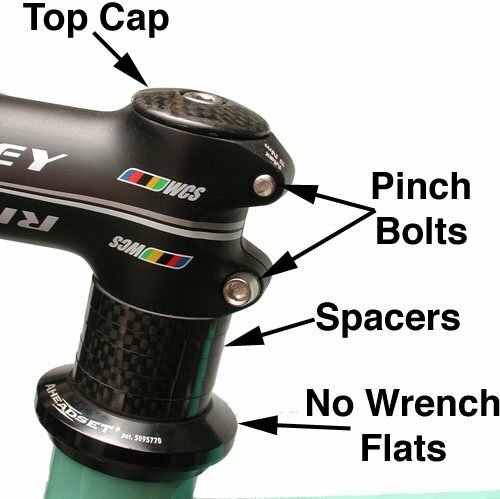 By flipping the stem one way or the other one can adjust the angle of the handlebars up or down by a few degrees. By removing spacers one can then move the stem down a few cm.s, then the spacers go back on top of the stem and under the top cap. This avoids permanently cutting the length of the metal tube under the spacers and stem...just in case one wants to be more upright in the future, or eventually sell a bike to someone who would want to be more upright. I was concerned that flipping the stem could make using the drops more difficult, but it has actually made riding in that position MORE comfortable. Before I felt like I had to arch my back to get my arms and hands where they needed to be. Now my posture feels neutral and comfortable. I can go a lot faster when I'm in the drops, too. I'm really looking forward to some duathlons next year--to really make use of that position on the bike. All this tweaking has confirmed that my next bike should have somewhat more aggressive geometry that will allow me a more "aero" position on the bike without having to lower things so much from stock.